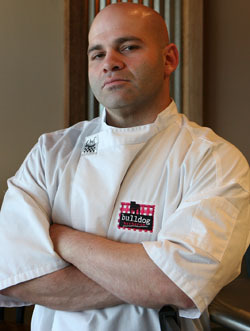 Bulldog Barbecue Chef Howie Kleinberg. (Photo courtesy of Michael Katz). It all began for him as a food-prep guy at the Intercontinental Hotel at a time when he admittedly knew "little-to-nothing" about the business. With enormous dedication, plus experience gained at Perricone's, the Ritz-Carlton, Tantra, and Timo, Howie Kleinberg became familiar to South Floridians as executive chef at Ivy Aventura (inside Loehmann's Plaza) and then at The Food Gang (in Surfside, just south of the Bal Harbour Shops). But it wasn't until the debut of the cable TV hit "Top Chef" when gourmands around the country took notice of him. An unrelenting and fiery on-camera persona won him the nickname "The Bulldog," and the moniker has stuck. So much so that in 2009, Kleinberg opened the wildly beloved Bulldog Barbecue on Biscayne Boulevard in North Miami Beach. And just about two years later, he already is set to premiere a spinoff, dubbed Bulldog Burger, which will be an intimate and affordable 70-seat eatery in the space adjacent to his existing restaurant. A: I would tell them to get with the best people possible to work with and not worry about how much money they're going to pay you. It's more important to focus on the knowledge you can get from them. Be sponge. Ask 100 questions and don't stop fighting until you get where you need to get. A: It's probably receiving a three-and-a-half star rating from the Miami Herald when we did Food Gang. And now I'm very proud of the fact that I own my own business and we're expanding it. That's probably what I'm most proud of, the fact that I'm in a position to give other people the opportunity to grow in their careers. A: Staffing. Finding the right people and keeping them motivated. When people are good, they have a lot of opportunities. So we're constantly making an effort to bring in people who have the potential to be great and work with them. Sometimes, finding them is a challenge. It's something we always have to keep up on. A: It definitely wasn't a chef. When I was a little kid, I wanted to play in the NFL. Then when I was a bigger kid, I realized I was never going to play in the NFL so I thought maybe I could coach on the collegiate level. A: I hope to keep growing my business and keep people interested in what I'm doing. To be the type of chef and owner who keeps it fresh and exciting so people always want to come see us and have a unique experience. A: Eric Ripert. He is so respected for his craft. There are so many chefs out there who like to take shots at each other. And he's one of those guys, and Thomas Keller is another one, who is above reproach. Nobody takes shots at those guys. They've reached the pinnacle of what you can do as a chef because they worked for it. That's why everyone in this industry has respect for them, because no one gave it to them; they had to go out and fight for it and earn it for themselves. A: A football coach. I've always had the ability to motivate people and to teach. And that helps me as a chef. They are very similar professions, in my mind. In one, you're teaching Xs and Os. In the other, you're teaching seasoning with salt and pepper. It's very similar. Just the subject matter is different. A: The instant gratification of seeing someone come in and have a great experience in the restaurant. To be able to be back there cooking, and then come out to the floor and have people shake your hand and tell you that they really love your place. There are plenty of jobs where you work just as hard but you don't have that [appreciation] and you don't get that face-to-face recognition with your clientele. A: The hours you have to put in to be a chef. Not that it's so many hours. But it's nights and holidays and birthdays. I'm used to it now. But it makes it a little bit harder on family and relationships when you're always working nights and weekends and holidays. When I was coming up, there was no such thing as a day off for a special occasion. Now that I'm getting older, and now that I'm in a relationship, it gets a little more difficult. It's just one of those things. A: I wish I'd had a little more fun on Top Chef and not taken it so seriously. And maybe that's something that's changed for me in business recently. I realized that I probably took my profession too seriously a few years back. Now I've gotten to the point where I like to have a little more fun with it. I think I got away from the fun of it, from enjoying the food, for a while. A: Share Our Strength. It's an organization whose motto is "No Kid Hungry." Chefs pool their resources to reach that objective. But there are so many worthwhile ones we've teamed with. Recently, we did something with Best Buddies. My father was very supportive of March of Dimes, so that's also a big one for us.